Perhaps climbing a flight or two of stairs has never really affected your breathing—until now. Or maybe you notice that it’s harder to breathe even when you’re simply watching television. What’s going on? You might wonder whether you are developing a common lung problem such as asthma or chronic obstructive pulmonary disease (COPD)—especially if you’re over age 40…you have a history of allergies…are a current or former smoker…or have been exposed for long periods to secondhand smoke, heavy dust or chemical fumes. Or maybe your are out of shape and need to lose weight. But don’t be too quick to make assumptions. There’s a chance that your lungs have nothing to do with your shortness of breath. Breathing allows us to bring oxygen into the body and expel carbon dioxide. When your body doesn’t have enough oxygen or has too much carbon dioxide, you automatically breathe faster. You’ll perceive this as breathlessness, a condition known as dyspnea. Anemia. It occurs when you do not have enough red blood cells or hemoglobin, a substance in blood that transports oxygen to tissues throughout the body. Various forms of anemia—such as iron-deficiency anemia or pernicious (low levels of vitamin B-12) anemia—can cause breathlessness. Anemia may be accompanied by: Fatigue, rapid heartbeat, leg cramps or difficulty concentrating. Next steps: Anemia can readily be detected by blood tests, such as a complete blood count (CBC) and blood analyses to examine the size/shape of red blood cells. Treatment: Your breathing will improve once the underlying cause of the anemia is identified and treated—with supplemental iron or vitamin B-12, for example, or with antibiotics for an ulcer (internal bleeding from an ulcer is a common cause of anemia). Iron-deficiency anemia also can occur with some cases of colon cancer due to a slow loss of blood from the colon. Anxiety. It is a common cause of breathlessness. When you are stressed or anxious, you tend to take short, shallow and rapid breaths. This breathing pattern, known as hyperventilation, is inefficient and causes changes in the normal balance of oxygen and carbon dioxide. Anxiety may be accompanied by: A rapid heartbeat, numbness or tingling in the hands or feet and sometimes a feeling of faintness. Next steps: Your doctor will first check for possible physical causes of breathlessness, such as asthma or a lung infection. You might be given a chest X-ray and spirometry, a test that’s administered in your doctor’s office and involves blowing into a device to measure lung capacity. Treatment: If tests show that you are physically healthy, your doctor may refer you to a psychiatrist or other anxiety-treatment specialist. You might benefit from counseling or an antianxiety medication, such as lorazepam (Ativan) or clonazepam (Klonopin). Also helpful: Abdominal breathing, which involves inhaling deeply through the nose for about 10 seconds, then slowly exhaling for about 10 seconds. But don’t make the mistake of performing this technique only when you’re feeling anxious. If you do it for about five minutes a few times a day, you’ll slowly begin to naturally breathe more deeply all the time, including during times of stress. If you feel light-headed while practicing abdominal breathing, stop for 20 seconds, then start again. Side effect of beta-blockers. These drugs are prescribed for high blood pressure, angina, heart failure and mild anxiety. Drugs in this class often cause shortness of breath because they affect beta-adrenergic receptors in the lungs as well as in the heart and arteries. 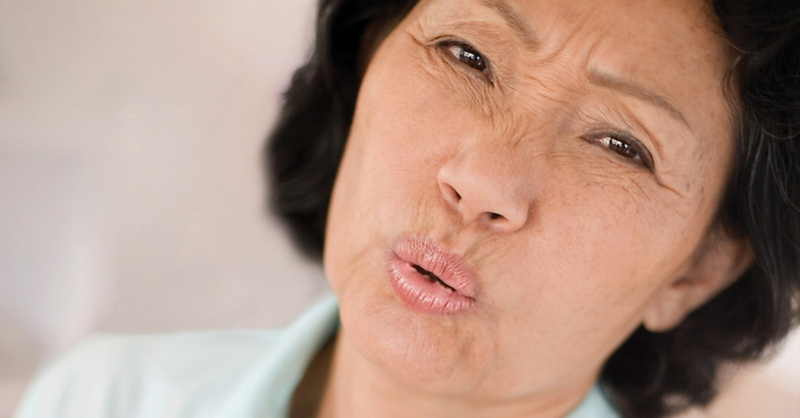 Use of beta-blockers may be accompanied by: Wheezing, changes in heartbeat or dizziness. Next steps: Suspect that the -beta-blocker may be to blame if your symptoms began within two weeks of starting the drug. When you see your doctor, bring a list of all the medications that you take. Breathlessness also can be caused by an allergic reaction to a medication, such as an antibiotic. Treatment: If the breathlessness is too uncomfortable, ask your doctor about switching to a different class of blood pressure medication. Or he/she might prescribe one of the newer selective beta-blockers, such as metoprolol (Lopressor) or acebutolol (Sectral), which are somewhat less likely to affect the lungs than older beta-blockers. Heart failure. It often causes shortness of breath because the heart can’t supply the body with adequate amounts of oxygen. What usually happens is that the heart’s pumping chambers, or ventricles, don’t fill with enough blood, so less blood is circulated with each heartbeat. Or the chambers don’t generate enough force to circulate blood efficiently. Heart failure may be accompanied by: Fatigue, a persistent cough or swelling of the feet, ankles and legs. Next steps: Among other tests, your doctor will probably order an EKG, a chest X-ray to determine whether the heart is enlarged or there’s fluid in the lungs, and a blood test for the hormone BNP (levels increase in patients with heart failure). Treatment: You’ll probably be given medications that lower blood pressure and reduce the heart’s workload. You also might need surgically implanted electrodes to correct heartbeat irregularities (arrhythmias) or increase the force of the heartbeat. Important: Shortness of breath also is a classic sign of a heart attack. If you’re suddenly breathless and it’s a new symptom, get to an emergency room right away or call 911. Pulmonary embolism. You should suspect that you have this condition, which occurs when a blood clot enters a lung, if you have sudden shortness of breath. What usually happens is that a blood clot from a leg vein travels to an artery in a lung and blocks circulation. About 30% of patients with a pulmonary embolism will die if they don’t get emergency treatment. Pulmonary embolism may be accompanied by: Chest pain and/or coughing (with or without blood). Some patients will notice pain, swelling or discoloration on part of one leg—a sign that blood clots have formed. Next steps: Call 911. An ultrasound or CT scan will be used to detect clots. Your doctor might order a lung ventilation/perfusion scan to show how well blood is flowing through the lungs. Treatment: You will be hospitalized if you have (or are suspected of having) a pulmonary embolism. You’ll probably be given intravenous heparin, a fast-acting blood thinner, along with oral warfarin (Coumadin) to prevent additional clots from forming. Most patients will continue anticoagulant therapy for at least six months. Even a slight cold or the flu can take your breath away, but don’t assume that a cold or the flu is all you have. Many people who think they have a cold actually have pneumonia, a lung infection that kills about 50,000 Americans every year. Walking pneumonia, the term for mild cases, usually clears up on its own within a week to 10 days. More serious cases of pneumonia, however, often require hospitalization and treatment with antibiotics. Serious cases of pneumonia usually are caused by bacteria rather than viruses. Red flags: Fever, cough, discolored or bloody mucus, chest pain and chills—especially when accompanied by shortness of breath—warrant a visit to your doctor right away. Also important: Get vaccinated for pneumonia if you’re age 65 or older…or if you have pneumonia risk factors such as smoking or a history of heart/lung disease, diabetes or liver disease. Acute bronchitis, inflammation of the main air passages to the lungs, is less serious than pneumonia but also can cause shortness of breath. Check with your doctor. *If you experience a degree and/or frequency of breathlessness that is new to you, see your doctor.